American contemporary womenswear designer, Misha Nonoo, collaborated with Aldo's shoe and handbag design teams to create accessories for her Spring/Summer 2015 runway show. Watch this behind the scenes video below which shows Misha in action the day before the big show. It's here that she talks working with Aldo, and the inspiration behind the collection. The pieces are appealing to my particular style aesthetic as I tend to be drown to more sophisticated, classic silhouettes that offer a splash of color to my neutral wardrobe. The color palette of the pieces are black, white, navy, gold metallic and orchid. The Aeaniel is the ballerina flat. It can easily be paired with palazzo pants or a sporty skirt. 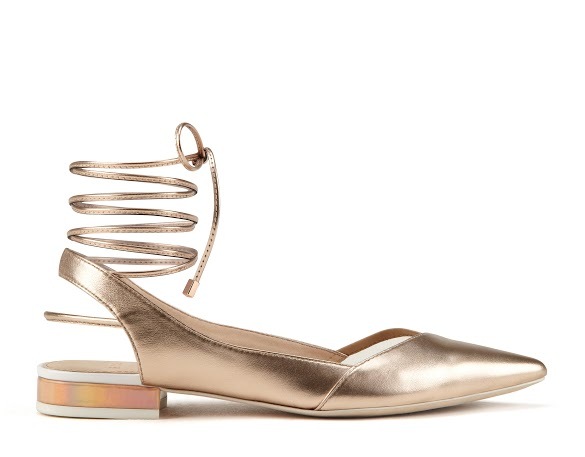 Birchell is the strappy high heel sandal. It is versatile as well with just the right degree of sexiness. Lastly, the oversized clutch is the perfect marriage between softness and structure. The purse also features a rose gold chain and clasp which adds chic details.